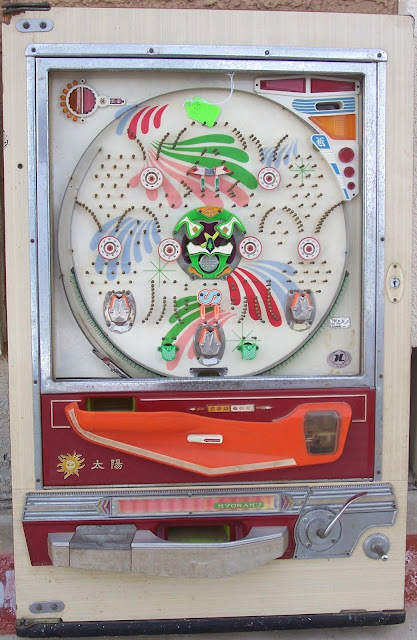 Evolution as a pachinko history: what is 'random'? We discussed a Japanese pachinko machine in an earlier post, a pinball machine, as an example of the difference between randomness and determinism, in an evolutionary context. Here we want to use pachinko machine imagery in a different way. The prevailing, often unstated but just-under-the-surface assumption is that every trait in life is here because of natural selection. Of course, for a trait to be here at all, bearers of its ancestral states up to the present (or, at least, the recent past) were successful enough to have reproduced. It would not be here if it were otherwise, unless, for example, it's itself harmful, or without function but connected to a much better, related trait since genes are usually used in many different bodily contexts and may be associated with both beneficial and harmful traits. Most sensible evolutionary geneticists know that many or even most sites in genomes tolerate variation that has either no effect or effects so small that in realistic population sizes they change in frequency essentially by chance. However, the widespread default assumption that there must be an adaptive explanation for every trait usually also tacitly assumes that probabilism doesn't make much difference. Some alert evolutionary biologists will acknowledge that one version among contemporary but equivalent versions of a trait can evolve by chance relative to other versions. But the insistence, tacit or expressed, is that natural selection, treated essentially as a force, is responsible. The very typical view is that the trait arose because of selection 'for' it, and that's why it's here. And speaking of 'here', here's where a pachinko analogy may be informative. If a bevy of metal balls tumbles through the machine, each bouncing off the many pins, they will end up scattered across the bottom ledge of the machine (the gambling idea is to have them end up in a particular place, but that's not our point here). So let's take a given ball and ask 'Why did it end up where it did?" The obvious and clearly true answer is 'Gravity is responsible'. That is the analogue of 'selection is responsible'. But it is rather an empty answer. One can always say that what's here must be here because it was favored (that is, not excluded) by fitness considerations: its ancestral bearers obviously reproduced! We can define that as 'adaptation' and indeed in a sense that is what is done every day, almost thoughtlessly. Gravity is, like the typical if tacit assumption about natural selection, a deterministic force for all practical purposes here. But why did this ball end up in this particular place? One obvious answer is that each starts out in a slightly different place at the top, and no two balls are absolutely identical. However, each ball makes a different path from the top to the bottom of the obstacle course it faces. Yes, it is gravity that determines that they go down (adapt), but not how they go down. In fact, each ball takes a different path, zigging and zagging at each point based on what happens, essentially by chance, at that point. This one might think of as local ecosystems on the evolutionary path of any organism, that are beyond its control. So, in the end, even if the entire journey is deterministic, in the sense that every collision is, the result is not one that can, in practice, be understood except by following the path of each ball (each trait, in the biological analogy). And this means that the trajectory cannot be predicted ahead of time. And in turn, this means that our interpretation of what a trait we see today was selected 'for' is often if not usually either basically just a guess or, more often, equates what the trait does today to what it was selected to be, expressed as if it were an express train from then to now. And this doesn't consider another aspect of the chaotic and chance-affected nature of evolutionary adaptation: the interaction with the other balls bouncing around at the same time in such an obstacle course. Collisions are in every meaningful sense in the game of life, if not pachinko, chance events that affect selective ones, even were we to assume that selection is simple, straightforward, and deterministic. The famous argument by Gould and Lewontin that things useful for one purpose, such as 'spandrels' in cathedral roofs, are incidental traits that provide the options for future adaptations--life exploits today with what yesterday produced for whatever reason even if just by chance. The analogy or metaphor has been questioned, but that is not important here. What is important is that contingencies of this nature are chance events, relative to what builds on them. Selectionism as a riposte to creationism is fine but hyper-selectionism becomes just another often thought-free dogma. Darwin gave us inspiration and insight, but we should think for ourselves, not in 19th century terms. A far humbler, and far less 'Darwinian' (but not anti-Darwinian! ), explanation of life is called for if we really want to understand evolution as a subtle often noisy process, rather than as a faith. Instead, even serious biologists freely invent--and that's an apt word for it--selective accounts, as if true explanations, for almost any trait one might mention. It's invented because some reason is imagined without any direct evidence other than present-day function, but then treated as if directly observed, which is rarely possible. Here is an interview that I just came across that in a different way makes some of the same points we are trying to make here. Everything here today is 'adaptive' in the sense that it has worked up to now. Everything here today is also a 4 billion year successful lineage, that all made its way through the pachinko pins. But these are almost vacuous tautologies. Understanding life requires understanding one's biases in trying to force simple solutions on complicated reality. First of all, no. I am not the lovechild of star-crossed siblings, or even cousins, or even second cousins. This is a gee-whiz kind of post. But the issues are not insignificant. Hear me out with the background, first, before I get to the part where my eyes bug out of my head and I pull out my kid's Crayola box and start drawing. If you're helping out your identical genetic twin (r=1.0), then as long as the benefit to you is greater than the cost, it's adaptive. If you're helping out your daughter (r = 0.5) then as long as the benefit to you is greater than twice the cost, it's adaptive. So already, the adaptive risk to helping out your daughter or your brother is quite higher. And it's even harder to justify the cooperation between individuals and their sibs' kids, and grandkids, especially ESPECIALLY non-kin. But, of course creatures do it! And so do we. As relatedness gets more distant and distant, we go from 2 times the cost, to 4 times, 8 times, 16, 32, 64 etc... You can see why people like to say "the math falls away" or "drops off" at first or second cousins when they're explaining where the arbitrary line of genetic "kin" is drawn. 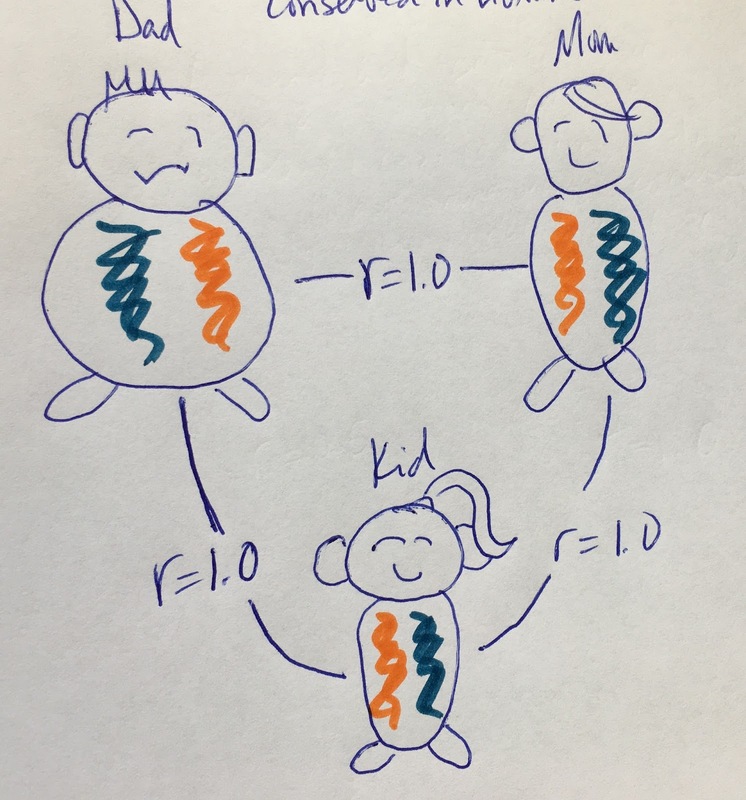 If you offer up a curious, "we're all related, we're all kin," someone out of this school of thought that's focused on explaining the evolution of and genes for social behavior may clue you in by circumscribing "kin" as the members of a group that are r = 1/8 or r = 1/16 but usually not less related than that. This has long bothered me because we're all genetically related and so much cooperation beyond close kin is happening. And it's been hard for me, as someone who sees everything as connected, to read text after text supporting "kin selection" and "kin recognition" (knowing who to be kind to and who to avoid bleeping), to get past the fact that we're arbitrarily deciding what is "kin" and it seems to be for convenience. I'm not doubting that cooperation is important for evolutionary reasons. Quite the contrary! It's just that why is there so much math, based in so many potentially unnecessary assumptions about genes for behavior, gracing so many pages of scientific literature for explaining it or underscoring its importance? Right. So. Even for folks who aren't part of evolution's academic endeavor, it's obvious to most that we're one half dad and one half mom. The sperm carries one half of a genome, the egg another, and together they make a whole genome which becomes the kid. Voila! 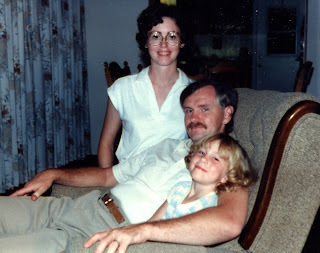 ... but there's biology above and beyond the genes we get from mom (and not from dad). And that song is great for teaching us that the rest of the egg and the gestational experience in utero provide so much more to the development of the soon-to-be new human. So "slightly more than half of everything" is thanks to our mothers. Aw! But, genetically, the mainstream idea is still that we're 50% our mom. I teach very basic genetics because I teach evolution and anthropology.And I'm not (usually) a dummy. * I get it. It's a fact! I'm half, genetically, my mom and I'm also half my dad. 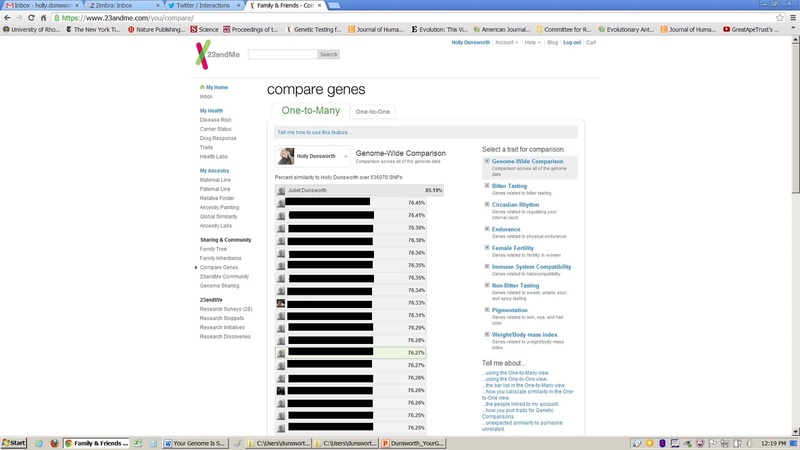 Percent similarity to Holly Dunsworth over 536070 SNPs (single nucleotide polymorphisms or, effectively/rather, a subset of known variants in the genome; Click on the image to enlarge). I am 85% like my mom and I am at least 76% like my students and friends who are sharing with me on 23andMe. Names of comparisons have been redacted. As far as I know, this kind of report is no longer offered by 23andMe. I spat back in 2011/12 and the platform has evolved since. Okay, first of all, it is a huge relief that, of all the people I'm sharing with on 23andMe, the one who squeezed me out of her body is the most genetically similar to me. Science works. But that number there, with my mother, it is not 50%. It's quite a bit bigger than that. It says I'm over 85% the same as her. What's more, I am also very similar to every single person I'm sharing with on the site, including example accounts from halfway around the world. Everyone is at least 60-ish% genetically similar to me, according to 23andMe. I know we're all "cousins," but my actual cousins are supposed to be 1/8th according to evolutionary biology. How can my mom be related to me by only one half? How can my actual cousins be only an eighth (which is 12.5%)? What is up with evolutionary biology and this whole "r" thing? Hi. Here is where, if they weren't already, people just got really annoyed with me. Evolutionary biology's "relatedness" or "r" is not the same as genetic similarity like that reported by 23andMe. Let me help unpack the 85% genetic similarity with my mom. Remember, it's not because I'm inbred (which you have to take my word for, but notice that most everyone on there is over 70% genetically similar to me so...). It's because my mom and dad, just like any two humans, share a lot in common genetically. Some of the alleles that I inherited from my dad are alleles that my mom inherited from her parents. So, not only is everything I got from her (50%) similar to her, but so are many of the parts that I got from my dad. Let me get out my kid's arts supplies. Here is a pretty common view of relatedness, genetically. 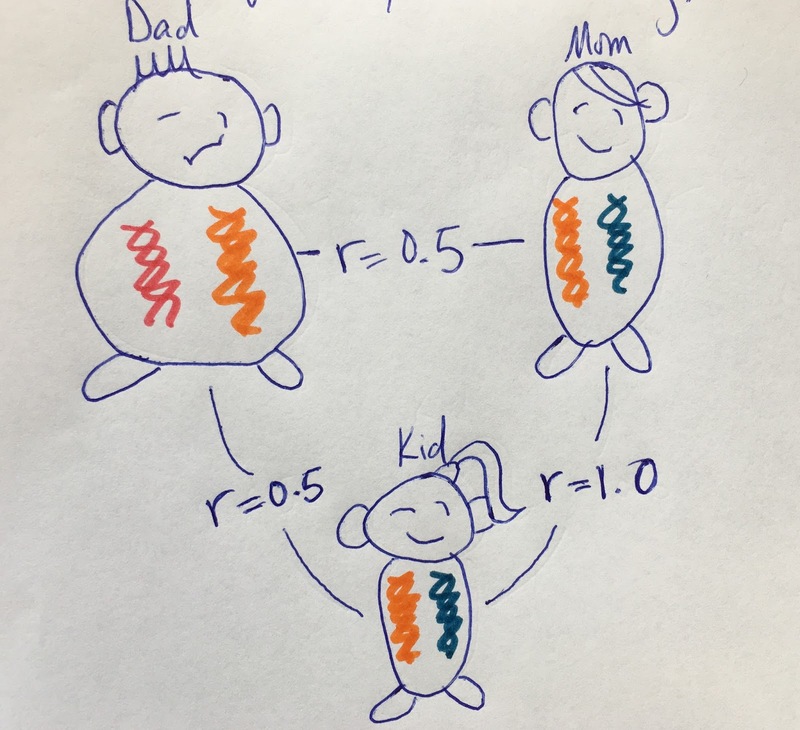 In our imagination, parents are not related (r = 0) which can lead our imagination to think that their alleles are distinct. 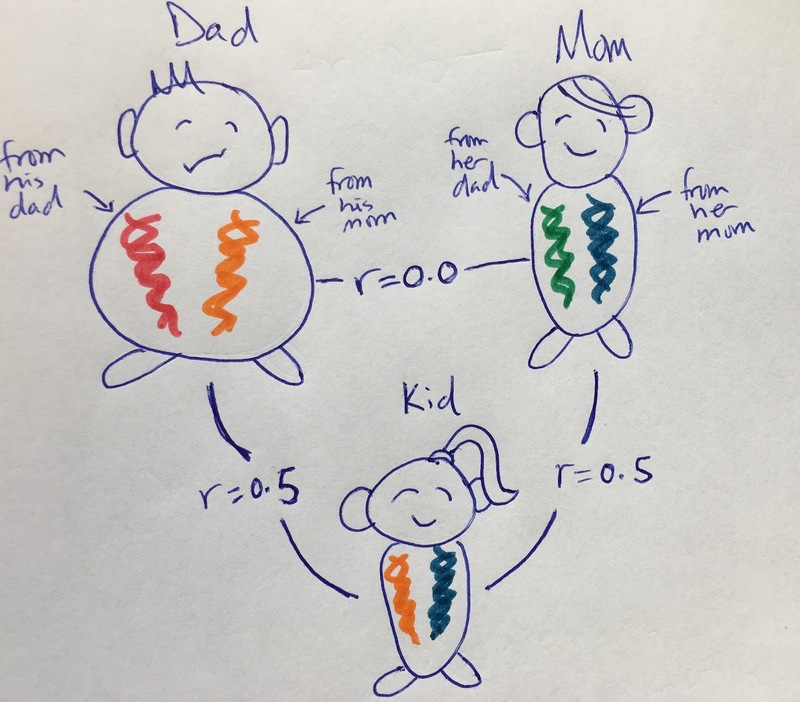 Here there are four distinct alleles/variants that could be passed onto offspring, with each offspring only getting one from mom and one from dad. In this case, the sperm carrying the orange variant and the egg with the blue variant made the baby. But few genes have four known alleles, at least not four that exist at an appreciable frequency. Some could have three. What does that look like? The green allele doesn't exist in the next example. 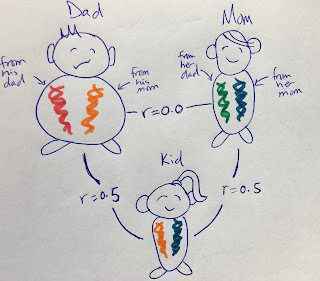 As a result of there being only three variants for this gene or locus, mom and dad must share at least one allele, minimum. That means, they look related and that means that, depending on which egg and sperm make the kid, the kid could be more related to mom than to dad. 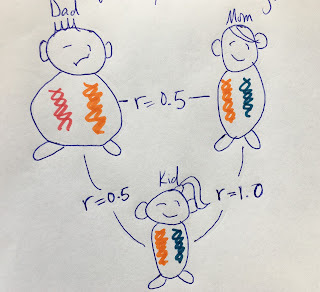 Now here's where people who know more than I do about these things say that the kid is not more related to mom than dad because she got only one allele from mom and that keeps her at r = 0.5. Again, I realize I'm annoying people and probably much worse--like stomping all over theory and knowledge and science--by mixing up the different concepts of genetic similarity (e.g. 50%) with "r" (e.g. 0.5) and horribly misunderstanding all the nuance (and debate) about "r," but I'm doing it because I'm desperately trying to know why these two related ideas are, in fact, distinct. In this third example, as is common in the genome, there are only two alleles/variants in existence (at an appreciable frequency, so not accounting for constant accumulation of de novo variation). An example of such a gene with only two known alleles is the "earwax gene" ABCC11 (there's a wet/waxy allele and dry/crumbly one). Here, the two alleles are orange and blue. Most humans in the species will have at least one allele in common with their mate for a gene with two alleles, and it's not because most humans are inbred, unless we want to redefine inbreeding to include very distant relatives (aside: which may be how the term is used by experts). 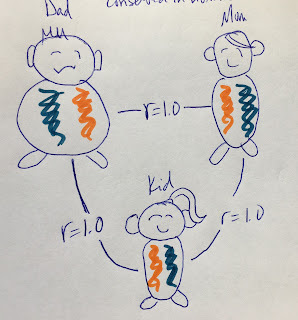 But as a result of the chance segregation of either the blue or orange allele into each of the gametes, two people with the same genotype can make a kid with the same genotype. And of course, making a kid with your same genotype is the only possible outcome if you and your mate are both homozygous (i.e. where both copies are of the same variant so that leaves no chance for variation in offspring unless there is a new mutation). So, I wandered a little bit away from my point with these drawings, but I had to because I wanted to get down from where my imagination has me (us?) with "r" versus how things really are with reproduction. We are baby-making with vastly similar genomes to ours, so we are making babies with vastly similar genomes to ours. So, I do see why biology says I'm related to my mom by one half. But, on the other hand, what does it matter if I got the thing I have in common with my mom from my mom or whether I got it from my dad? Because I got it. Period. It lives. Period. [Inserted graf January 20, '17] Saying it matters where I got the similarity to my mom keeps us at r = 0.5. Saying it matters only that I inherited DNA like hers keeps us always, all of us, at r > 0.5 with our parents and our kids because any two babymakers share much of their genome. And the fact that this (see 2 and 3) happens so often is why I'm a lot more than 50% genetically like my mom, and the same can be said about my genetic similarity to my dad without him even spitting for 23andMe. So, here we are. I don't understand why our relatedness to one another, based on genetic similarity, is not "r."
I hope it's for really beautifully logical reasons and not something political. If "r" was defined by genetic similarity, then would cooperating with my 76% genetically similar students and friends be more adaptive than the credit I currently get from evolutionary biology for cooperating with my own flesh and blood son? If "r" was defined by genetic similarity, then could we use the power of math and theoretical biology to encourage broader cooperation among humans beyond their close kin? Maybe I should re-learn the math and learn all the other math. And it would be worth it, you know, because despite my relatively weaker math skills, I bet we're more than 50% genetically similar. *from 23andMe: "You have 321 Neanderthal variants. 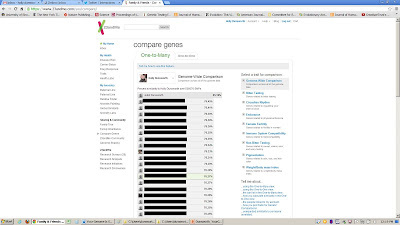 You have more Neanderthal variants than 96% of 23andMe customers."